SEOUL, Nov. 14 (Yonhap) — BTS’ agency Big Hit Entertainment has issued a statement over the recent controversies surrounding its artists’ wardrobe choices. “We don’t condone any activities of war or the use of atomic weapons. 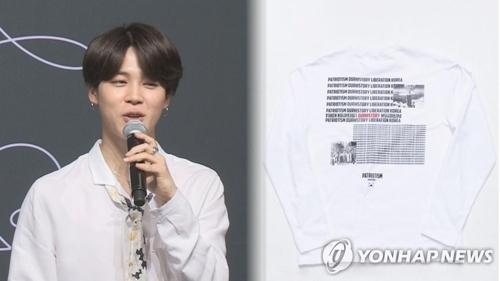 … We had no intention to hurt victims of the dropping of atomic bombs,” it said Tuesday night, referring to the controversy regarding BTS member Jimin’s T-shirt that had an image of an atomic bomb. It was the company’s first public statement on the issue since Japanese music programs have recently taken issue with the clothes and called off BTS’ appearance. “We sincerely apologize for failing to take the precautions that could have prevented our artist from wearing it and unintentionally inflicting pain on atomic weapons victims and those who feel uncomfortable to see the association of our artists with imagery related to atomic bombings,” the statement read. During the group’s dome concert in Tokyo on Tuesday, Jimin indirectly addressed the issue. “My heart really aches. … Not only ARMY but also many people around the world must have been surprised and concerned over recent controversies,” he said. “I will never forget our first Tokyo Dome concert. I am so happy to be here with you. I hope you feel the same,” he said. “We would like to offer our sincere apologies for inadvertently inflicting pain and distress on anyone affected by totalitarian regimes in the past by failing to strictly review the clothing and accessories that our members were made to wear, as well as to anyone who may have experienced distress and discomfort by witnessing an association of our artists with imagery reminiscent of political extremism,” the company said. It emphasized, however, that the company, not individual artists, should be blamed for their wardrobe choices, claiming “extensive schedules and the complexities of on-site conditions” made it hard for artists to carefully review their attire before wearing it. The company said it contacted associations representing those affected by the atomic bombings for further explanation and sent a letter to the Simon Wiesenthal Center to apologize. Meanwhile, the K-pop artist group held the No. 1 spot on Billboard’s Social 50 chart for a landmark 100th week, becoming the first group to achieve the mark since the chart started in December, 2010, according to data for the week ending Nov. 17. It has held onto the title for 70 consecutive weeks since July last year. BTS’ repackaged album, “Love Yourself: Answer,” ranked 66th, staying on the Billboard 200 for 11 weeks in a row.